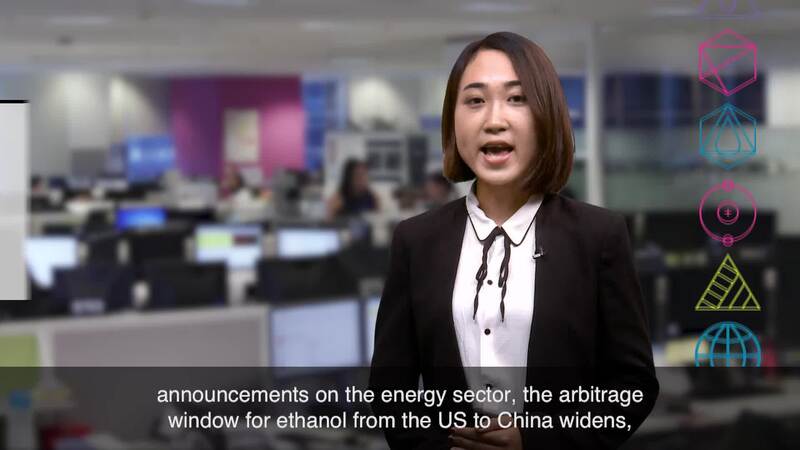 On Platts Market Movers this week, Commodity Associate Shi Yun Fan examines the potential impact of China's policy announcements on the energy sector, the arbitrage window for ethanol from the US to China widens, and the high premiums for ESPO blend crude. She also talks about the Platts Global LNG Report, which will be launched on October 25. The report features insights and forecasts from Platts, PIRA Energy, Ratings and Market Intelligence, as well as interviews with key industry leaders and experts. The report will be available here. This week, the impact of China's policy announcements on the energy sector, the arbitrage window for ethanol from the US to China widens, and no end in sight to high premiums for ESPO blend crude. But first, in oil, China is due to release detailed import and export data for September for a range of commodities this week. Its oil products exports were widely seen to have hit a 5-month low in the month, even though its refinery throughput hit a record high, so this data will provide some insight into the country's apparent oil demand. The Far East Russian crude market is expected to be busy this week, with a slew of medium sweet ESPO Blend cargoes for December loading on offer. Asian traders expect the blend's premium to remain supported above $3 a barrel for the rest of the trading cycle, as winter demand from Asian refiners is starting to ramp up, and the current backwardation in the Dubai pricing structure favors the Far East Russian grades. In contrast, activity in Asia thermal coal market has stalled as buyers in China monitor developments at the National Congress of the Communist Party, which opened last week with an emphasis on environmental concerns and pollution control. They are awaiting further clarity on policy shifts and production cuts to gauge price direction before committing to spot deals. In shipping, ample supply of clean tankers in the Middle East looks set to take its toll on freight rates this week. This could be bad news for owners but a blessing for consumers who want to get oil products delivered. This week, we expect to see a flurry of hiring activity on vessels loading in the first half of November. In agriculture, the Platts CIF Philippines ethanol prices will start the week at a 20-month low on the back of weaker US prices, where latest production data was at the high end of market expectations. This leaves the arbitrage window from the US to China open, and sources said buying interest from China was heard as far forward as the second quarter of next year. In LNG, the JKM has eased for the first time since a rally that began in early September, which was driven by strong early winter demand from North Asia. Traders said high China inventory levels and covered December demand from North Asian buyers were putting spot prices under pressure. So, is this the turning point for JKM prices, or will they correct after a brief decline? Send us your thoughts on Twitter with #PlattsMM. And finally, do keep an eye out for our first Global LNG Report, which examines the forces driving commoditization in the LNG industry. It includes insights and forecasts from Platts, PIRA Energy, Ratings and Market Intelligence, as well as interviews with key industry leaders and experts. The report will be available on Platts.com from October 25. Remember to join our conversations on Twitter with #PlattsMM. Thanks for kicking off your Monday with us and have a great week ahead.